Over 25 years of being electrical contractors, we’ve worked on projects of all sizes and descriptions and thought we’d seen it all. 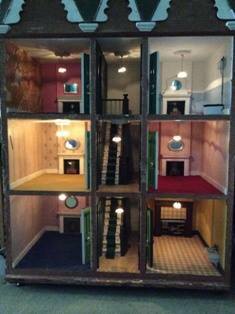 When we say ‘no job too small’, however, we didn’t expect to get a rewire of a dolls house! Our Mr Electric electrician has just installed new lighting in this beautiful antique dolls house, which is being passed down to the fourth generation in the family that own it. Built in 1900 and bought by our customer’s grandfather for her grandmother in 1947, her father then re-decorated the house in 1974 and put in mains electric with torch light bulbs. We have now re-wired it and put in new lighting before our customer passes it down for her daughters 5th birthday! Fiona in our office sourced a range of art-deco lights from the Dolls House Emporium and our engineer Alan (or ‘big Al’ as we call him) managed to complete this intricate job with some parts almost too small for him to handle!